Are you saying that in this Republic, Zeno thinks social roles no longer play a part? it seems like there are two obvious ways of understanding oikeiosis. 1. Universal love without distinctions. 2. Gradated love with distinctions. Ah, I think I see one source of confusion here. Obviously I have a special responsibility toward my daughter, but I also have a responsibility not to think of her as more intrinsically important, or worthy of respect or dignity, than any other human being. That’s a crucial aspect of cosmopolitanism, and that’s the point of oikeiosis. For practical purposes, of course, I will take special care of my daughter because she depends on me, she is nearby, and so forth. But even so, that’s not the kind of hierarchy Peterson is talking about (remember? it started there!). He seems to think that men ought to be in control, and women put in their place. That sort of hierarchy is entirely unaceptable to a Stoic. You, like all of us, inhabit more than two roles. In practice, (1) universal love without distinctions commits you to treating everyone the same, whether your daughter, parents, or a stranger with a vicious character. I disagree. The point is to strive for universal love, even of strangers with vicious characters. And no, that does not at all commit me to treat everyone the same. 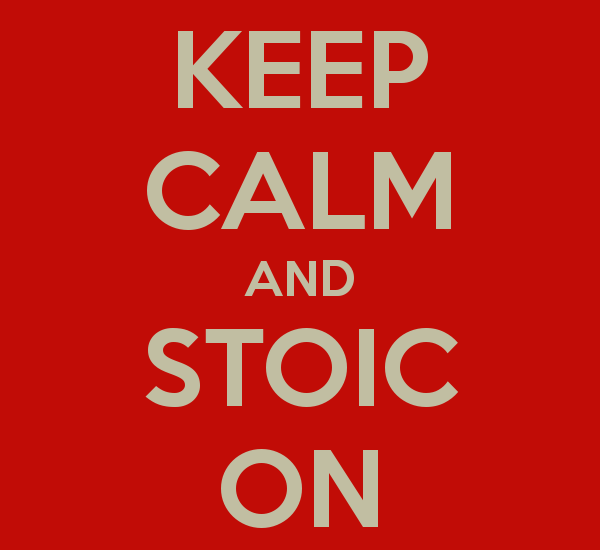 The Stoics take even violent action against injustice when needed, but do so always with regret and understanding. What, then, is a human being? A part of a city, first of all that which is made up of gods and human beings, then that which is closest to us and which we call a city, which is a microcosm of the universal city. Again, recognizing roles, division of lavor, etc., is in no contradiction at all with the idea that we should accord every human being the same inherent worth. Having read a bit of Chinese philosophy before coming to Stoicism, I find this remark fascinating. If we could take that argument back in a time machine to the Warring States period, we might be able to build a bridge between the Mohists (who advocated a utilitarian universal love) and Confucians (who advocated a virtue-based partiality toward your local family & responsibilities). I wonder if such a synthesis already appears somewhere in later Chinese tradition. So far as I am aware, you could probably argue the Neo Confucian Wang Yang Ming, or some other Neo Confucian creates something like a synthesis between the universal love without distinctions of Mohism and the gradated love of Confucianism. So far as I know, Wang Yang Ming considered as ‘persons’ we have duties to in our hierarchical ‘family’ not just our biological family, but also all: humans, animals, and inanimate things. While he didn’t conceptualize these duties as equally prioritized duties, and he expected them to conflict, they are duties of concern towards everything nonetheless. Sorry for the wall of text, and thank you for your continued engagement. I’ll try to keep things short on this one. Thanks for patiently clearing me up about Zeno and answering my questions. Could you recommend a translation of the fragments we have of his writings for me to pick up? What you say about taking special care of your daughter while simultaneously extending your care to others makes perfect sense to me, and sounds like a pragmatic hybrid of (1) universal love without distinctions and (2) gradated love with distinctions. This is what I take oikeiosis to mean in practice, so you and I are in perfect agreement here. I agree that recognizing roles and a division of labor is consistent with treating everyone with worth. A place where I think we regretfully disagree, is on whether or not Peterson espouses a comparable kind of oikeiosis in his conception of hierarchy. I think he does. I don’t think he believes that men should have control over women. I agree with you that this idea is incompatible with Stoicism. I also think it is incompatible with Peterson. A possible root of a quote like this is that Peterson does make claims about what he believes are inherent gender differences which he claims are backed by solid ‘science.’ I, probably just like you, consider these claims questionable. Now, I don’t think he’s lying or fabricating studies from thin air. I just don’t think the studies he’s referring to are as solid as he claims. I suspect less nuanced supporters of Peterson could use his arguments about inherent gender differences to support questionable political goals about why men should control women in an oppressive hierarchy (hence my comparison of them to Crates and Alcibiades.) At the same time, I see how (uncharitable) critics of him could represent his belief that there are differences as a commitment to oppressive hierarchies. See Dan Kaufman’s recent article on Electric Agora about negative epithets replacing philosophical discussion. Anyway, as we’ve already went over, you suspect I may be being too charitable to Peterson, and fair enough, I may be. Still, I’d appreciate seeing exactly where he makes the claim you say he does, because that simply doesn’t cohere with the Peterson I’ve encountered. Once again Massimo, thanks for your sharing your careful consideration on matters of ethical practice in a public forum where all can learn. There seems to be some measure of agreement that we MS supporters should seek to build bridges with TS if they are agreeable. If we are going to fight with anyone let’s pick on modern Epicureans ( just kidding in case anyone takes me literally). no my response above was to Tim, not you. Sorry for the confusion. I didn’t see any quotes of Fisher in Tim Bartik’s comment, so I had assumed that you meant me. … explicitly did not allow someone who does not subscribe to TS to join their Facebook page (I don’t know whether this ban is still in effect). I can report that there were no ideological purity tests when I signed up. I just clicked “Follow” and promptly received a welcome message from Chris. As you say, still a pretty strict policy, and one that is not welcoming for people with other metaphysical persuasions. No, we aren’t. A sage would make absolutely no distinctions between his daughter and anyone else. It’s just that I’m not a sage. But thegoal, following Hierocles, is to pull the external circles as close to oneself as possible. This is really not that different from the Christian concept of love (even) your enemy. A place where I think we regretfully disagree, is on whether or not Peterson espouses a comparable kind of oikeiosis in his conception of hierarchy. I think he does. No, I’m sorry. I have just watched a few additional clips of him, and I really cannot comprehend how anyone would think of him as even remotely close to Stoicism, or interested in anything like oikeiosis. I have given plenty of links to back this up in my earlier post on him, so I don’t see any good reason to revisit the issue. E.O. has already corrected the record concerning TS’s rules. I still find them unwelcoming. The MS Facebook page does not have such limitations. That said, again, I’m glad to hear thet Fisher has softened a bit of late, and I’ll do what I can to see if the people over at the MS site may want to reopen dialogue. Massimo I agree with you that Peterson is not a Stoic despite some similarities. Personally I disagree with him on many respects but I believe, contrary to his critics on the left that he should be heard. He is a conservative and I think conservative voices should be permissable in a free society. My attitude is ” I disagree totally with your view but I will fight to the death for your right to say it” – that is a classical liberal view. Unfortunately the word “liberal” has come to mean something else, the “liberal left” and I think it is reasonable to say that many with such values demonise conservatism. To be a conservative is not much different from a fascist who must be denied a platform. I think however there is a much broader issue here than just Peterson and that is the postmodernism which is so influential in our societies and which is diametrically opposed to everything we stand for as Stoics. Postmodernism does not support the idea of a human nature which as moderns we realise has resulted from evolution. As you know it denies any over arching truth claims such as the universal value of virtue for achieving eudaimonia. It even goes so far as to challenge rationality itself since rationality like science is they claim to be socially constructed. These philosophical views and the politics emerging from them represent threats to our society; identity politics focuses on what divides us rather than our common humanity; morality is entirely relativistic and subjective; the impartiality of science is questioned. I think this is where Stoicism should be directing its critique. Certainly once the dominant culture wakes up to what Stoicism stands for we can expect a back lash. Hence the importance of distinguishing Stoicism from the men’s movement as you have done here. I think we need something like a Stoic Manifesto to outline the humanism, cosmopolitanism and ethnical values we stand for. Thank you for linking to that translation of Zeno. Regarding Peterson: I appreciate your effort to reconsider your position and also respect the fact your opinion has not changed. On the subject of Peterson and his potential compatibility with Stoicism (or lack thereof) it does not seem we will agree for now and as you’d said, there’s no reason to revisit the issue at this point. Thanks for the good discussion! I don’t know if we need a Stoic manifesto per se, but then again, what else is this blog and Masimos book if not an excellent modern protreptic? I agree, I’m not in favor of shutting down speech, deplatforming, etc. That said, I see no danger that Peterson is going to lose his platform. His YT channel has more than a million subscribers (a good chunk of whom pay for it), his book is a bestseller, and he is all over the media. I certainly agree that postmodernism is not Stoic, but I honestly think PM peaked in the ’80s and ’90s and has been on the retreat since. Nowadays the most powerful voices of relativism come from the far right, beginning with Trump’s fake news and alternative facts. That said, again, I’m glad to hear thet Fisher has softened a bit of late, and I’ll do what I can to see if the people over at the MS site may want to reopen dialogue. That’s all anyone could ask. I’ll close just by seconding E. O. Scott’s endorsement of Chris’s podcast. It really is very good, even if, like me, you hold to a more secular worldview.